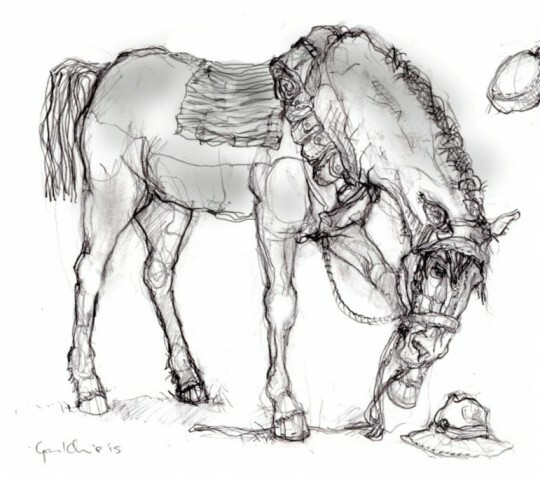 Matt Gauldie’s poignant sketch of the rider-less war horse ‘sensing’ the 4th Waikato Mounted trooper’s hat captured the ‘essence’ sought by Waikato Equestrians for a memorial. Portraying the bond between horse and rider, this was quickly identified by almost all viewing the sketch (BELOW) during the consultation phase, ‘reading’ the artwork without prompting. Our artists’ brief called for a memorial to recognise the contribution of New Zealand’s 10,000 war horses in an artistic manner appealing to the wider community and in particular to children. Matt’s winning concept will be bronze, life-size, facing the cenotaph, child-friendly, able to be climbed over, sat upon, durable, ever-lasting, iconic, with high visibility from the popular riverside pathway and Memorial Parade. This concept is endorsed by those carrying the legacy of the 4th Waikato Mounted and military community and lovers of horses and history. The bronze statue will also mark the bicentenary of the horse in New Zealand (come with Rev Samuel Marsden in December 1813), Hamilton’s military origins 150 years ago, and the Waikato region’s status as the contemporary Equine Centre of the nation.